Tires and the ability of a driver to use their tires well, have always been critical to success or failure in Formula One racing and any other racing categories. But it’s been especially true with new Pirelli supplier. With new tire supplier Pirelli pushing the established boundaries with aggressive compounds specifically designed to increase the importance of tire management, teams and drivers are being challenged in 2011 and beyond like never before. So getting race strategy right is vital. While strategic choices depend on a number of different factors, one of the most important questions for teams to decide is during which point of the race they wish to be fastest. 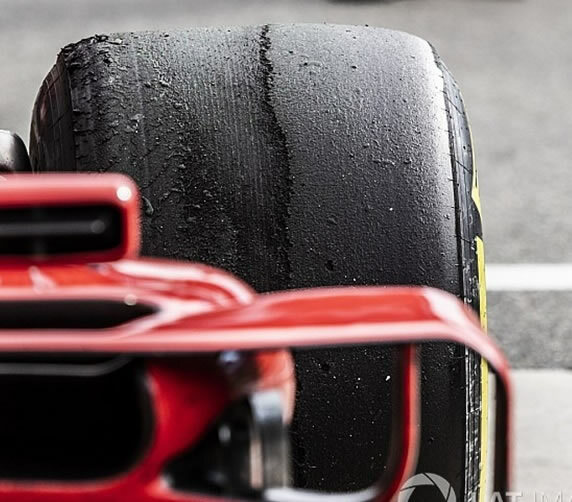 It doesn't take an expert to realize that the latest generation of Pirelli tires are having a big impact on racing, yet extracting consistent performance from the rubber is proving to be a dark art. Getting the tire to perform within its "operating window" has become the Holy Grail to qualifying and race successes. If it was an exact formula then clearly there wouldn't be such an issue, but the sensitivity of the tires means their peak performance has been a moving target between circuits and throughout a weekend. The tires tend to have a relatively narrow optimal operating window, so loads, running pressures and temperatures must be controlled and monitored as well as possible. Opting for the quickest tire - which usually corresponds to the softest available compound - at the start of the race will enable drivers to make a quick getaway and pull out an early advantage: but this may come at the price of being overtaken by drivers who are on the quicker tire during the middle and final stints of a race. Teams use complex computer programmes to simulate their race speeds using different strategies, but one thing that these systems cannot take into account is the strategies that other people are adopting and the likelihood of being blocked, either by slower competitors, the nature of the circuit, or racing incidents such as accidents and safety cars. Teams study the likelihood of such occurrences carefully and these have a major influence on the strategy. The weather is also a big factor, as the arrival of rain often sends most strategies out of the window. Ultimately, the key ingredient to every strategy is flexibility. The teams with the most reactive tacticians often score the top results, as they are able to respond in real time to unforeseen events and the initiatives from their rivals. And with Pirelli’s new range of PZero tires providing another exciting but changeable element to the races this year, speed of reaction is more vital than ever. The difference is that now the teams and drivers are forced into a balancing act where they have to trade speed against degradation over the course of qualifying and the race. The same was the case last year, but this year's (2012) compounds are more sensitive to variables such as temperature, setup and the way the driver treats the tire throughout its life span. People who are actually USING tires are serious road and rally racers, circle-track racers, and autocrossers. They have learned a lot about tires by trial and error, or their team collected data. Hopefully, these few tips will help and offer some answers that will generate more knowledge among us, normal people and "will be" racers and make them more confident when they're using their tires at the limit. Lower lap times forever! Degradation is a thermal performance loss - that's from the tires overheating or underheating essentially, taken to extremes in terms of lap time. Wear is the physical wear of the tire, we can call it consuming of the tire. The two are linked, though not necessarily in a equal way, but they are linked. Tire suppliers are fighting on wear because you need the tires to last a certain time and they are fighting on degradation to make sure they deliver the grip over the period of that life. Managing both of those is the tricky balancing act for these tires. Changes in setup can solve one problem but can create an issue elsewhere. The trick is to squeeze as much performance out of the tire without stressing its limitations. A racecar uses a set of tires a length of time, called a tire stint, mainly determined by the number of laps required to use the fuel allowed by the rules. In most race series it takes more time to refuel the car than it does to change tires, so no time is saved by refueling only. In professional racing there is no reason for the tires to have a useful life that is any longer than a fuel stint. For most tires the first lap or two are the fastest laps those tires will ever produce. 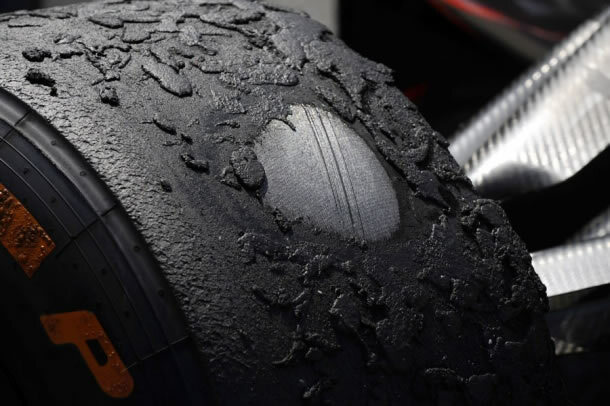 During Michelin - Bridgestone good old-fashioned tire Formula 1 war, some Michelin tires appear to increase in performance after five to seven laps and reach peak grip during laps 10-20 before falling off slightly. The Goodyear tires sold to NASCAR Winston Cup teams, "give up" at least a second in lap time from the second through the tenth lap and continue to deteriorate until the end of the stint. In fact you can see the tires "give up" during the two-lap qualifying runs for the Nextel Cup races. The first lap is almost always the quickest and many drivers just run one lap and go back into the paddock. The amount of give-up from the first to the second lap is 0.05 to 0.1 seconds per mile of lap. So why do tires give up? The rubber in tires undergoes cyclic stress at very high levels. The work done by these rubbers result in heat generation. The combination of high cyclic stress and high temperature is bound to generate mechanical and chemical changes in the rubber. Some elastomers, and rubber falls into that category, exhibit stress softening and permanent set. Stress softening has been attributed to displacement of polymer network junctions and entanglements and/or the incomplete recovery to original positions of those junctions and entanglements after stress deformation. The presence of fillers [carbon and silica] introduces possible additional softening mechanisms, including breakage of rubber/filler attachments, disruption of filler structure, or chain slippage at filler surfaces. When intermolecular structures are irreversibly disrupted or reform in new positions while the polymer is extended, the result is permanent deformation. The rubber is said to have "taken a set." 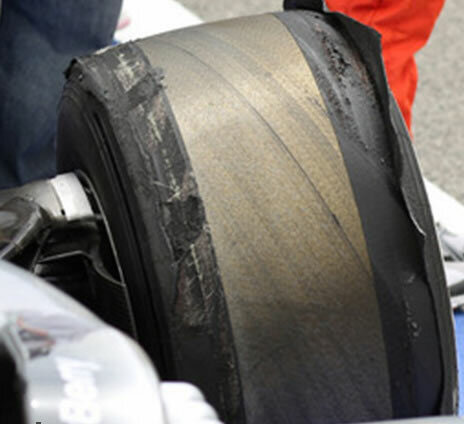 Delaminated tire on Hamilton's Mercedes during free practice at Bahrain GP 2013. Bias-ply material (nomex, kevlar) is exposed after tread surface fly away. A rubber compound is a mix of many materials, including chemically active agents. An excess of certain kinds of active agents can provide an opportunity for a disrupted or broken bond to repair itself by rebonding at the same location or in a new location. Another mechanism for tire give-up is more simple. The tire might wear to a tread thickness too thin to generate enough heat and the tire temperature falls out of the range for max grip. A thick tread, even a slicks, deforms and the resulting hysteresis generates heat. A thin tread deforms less, generating less heat. Tires are a very complex thing and there's a very complex chemistry involved in producing a racing tire. Just because they're black and round we've taken them for granted for too long, but there's some very clever chemistry in getting them right for racing purposes and it's entirely possible within those boundaries that you can produce a tire that requires a lot of understanding to get the best out of it. Rubber is a mixture of materials and chemicals manufactured with mechanical processes and various heat and pressure cycles. In use, tread rubber sees mechanical working and time at elevated temperatures very similar to the processes it saw as it was manufactured. It makes sense that more of the same processing would further change the rubber. The material in a new race tire is semi-stable. If the tread rubber had been totally cured it might be too hard to do its job. So stress and heat can continue the curing process. Even small amounts of energy from ultraviolet wavelengths in sunlight, ozone in air, heat, or mechanical working can cause the rubber in a tire to continue its vulcanization process or change in some way. The first heat cycle is called scrubbing. Every heat cycle changes a tire to some degree, generally in the direction of harder, less flexible, and less adhesive. Race tires can loose effectiveness before the tread wears through if they go through many heat cycles. For some tires three cycles is too many, while others show a performance drop off initially and then maintain a good level of performance until the tread is worn off. Smart race organizers are incorporating long-lasting tires into their rules so that "spec" tires can lower the cost of racing. The cause, typically, is overly aggressive driving with a tire that is too soft and grippy for the conditions or the driver has overworked the tires before getting them up to a working temperature. Abrasion patterns are not necessarily caused by gross sliding. A requirement for the development of an abrasion pattern is "unidirectional sliding." Sliding in random directions does not produce these patterns. The orientation of the pattern is important because it indicates the direction of relative motion between the tread and the road. Here's how that pattern gets worked into the rubber. When a new rubber sample is continuously abraded in the same direction, the rubber develops an array of nearly parallel ridges at right angles to the abrasion direction. The shape of the ridges in cross section, seen in picture, is saw toothed, with the teeth pointed against the direction of abrasion. During sliding, deflection waves in the rubber turn into peaks which are bent over, exposing the upstream side to abrasion. The peaks wear thinner into teeth and the tips are eventually torn off. Sliding on smooth tracks does not always produce abrasion. Abrasion is generally initiated by local stress concentrations at the contact between track asperities and rubber. Abrasion intensity depends on shape rather than size of the asperities. Experiments have shown that road surfaces exhibit wide variations in abrasion characteristics. Lab experiments with abrasion in an inert atmosphere (nitrogen rich for example), show less abrasion than the same process in air. This leads to speculations that antioxidants in a rubber compound can make it more resistant to abrasion. Unfortunately, once a graining pattern is worn into the surface of a tire it's difficult to wear the pattern away. The ridges tend to perpetuate as wear continues. Even worse, since the tread is not evenly loaded after it has been grained, the tire loses grip. It's just another way for a driver to mess up. That's why experienced drivers are so valuable. Graining is generally consequence of abrasion. 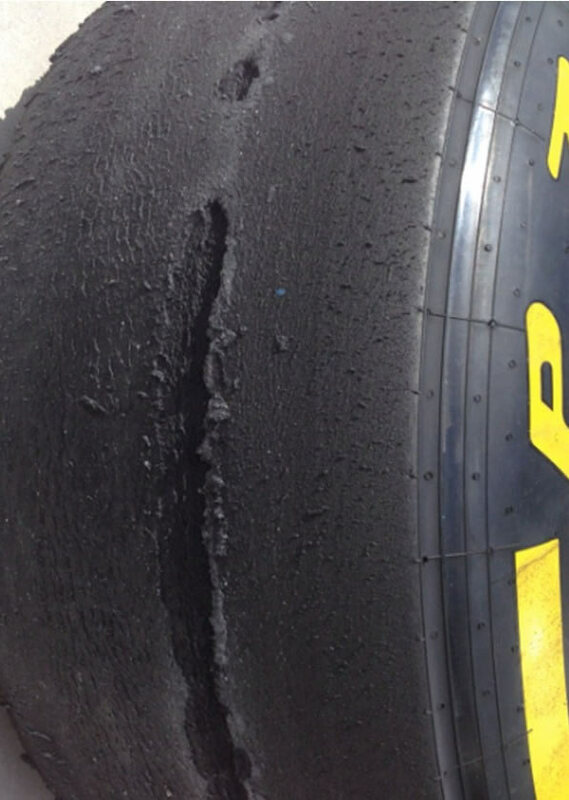 Graining and blistering are aspects of compound (tire) performance in motor racing, rather than safety issue. It is extremely rare that because of this two you can get tire explosion or something like that. But if blistering or graining is left unchecked, it can, if you keep using a tire and wearing it down (it depends how stupid you want to be ultimately), lead to tire failures. Ultimately, everything can be a safety issue if you continue beyond natural limits of use. Ripped wide open, the left rear flat-spoted Pirelli P Zero of Vitaly Petrov's Renault R31 shows just what damage a high-speed spin or hard braking can do to F1 tire. During 2011 Friday's first practice session for the Malaysian Grand Prix, the Renault's left front suspension collapsed approaching turn nine. With Petrov's left foot pressed hard on the brake pedal, the car went into a wild spin and the slick tire's bias-ply material was exposed for all to see. It's called graining because the rubber rolls off into grains. Laying down more rubber will increase grip and help with graining. Front tire with extreme graining, consequence of abrasion. This tire is finished! Rear tire with graining on the inside edge, perhaps due to excessive camber. 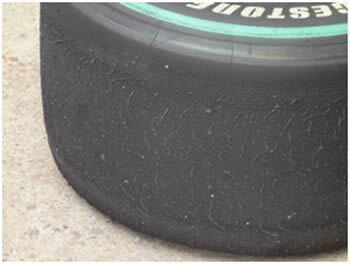 The graining is not present across the entire tread, suggesting slippage during acceleration. More camber would create more graining and the pattern would appear over a wider area of the tread. A more accurate description would have been, "It's called graining because the tire surface takes on a grainy texture. The soft, adhesive tread surface digs into the track texture, gets deformed into waves, and as sliding continues the waves turn over wearing rubber off the upstream side of the wave. When the sliding stops the deformed rubber snaps back leaving a peak pointing against the direction of travel. As more rubber is laid down during the race, grip will be increased and there won't be enough side loading on the tread surface to start the wave formation. Poorly balanced car, maybe one with excess understeer will grain the front tires more readily than a better balanced car. And opposite. Since some drivers need more understeer for comfort than others, driver style can also contribute to graining. 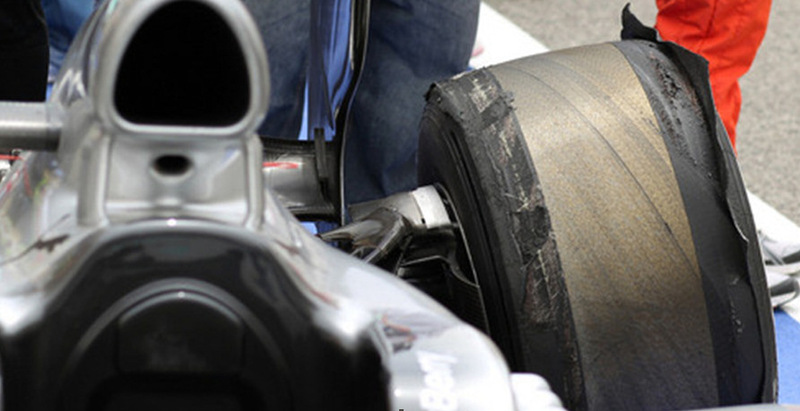 Another factor is the relatively light loading of F1 tires. The contact patch is wide and the cars are light. I don't think you'd see that same type of graining at NASCAR events. 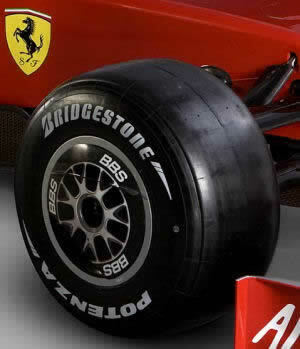 Of course the rubber formations of Goodyear and Bridgestone are entirely different. Before we described the vulcanization process and mentioned that if the process goes too far, the rubber can "revert" or return to its uncured state. Reversion can also happen when race tires get way too hot. When you see a driver lock up a tire the smoke tells you something bad is happening. The resulting flat spot is caused by frictional heating of the tread rubber causing reversion. The overheated rubber softens and is scrubbed off the tire. Another, less severe, form of reversion is blistering. 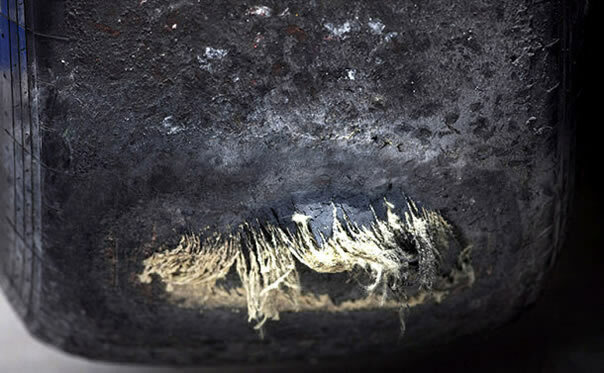 The photo left shows a front right tire with a line of blisters around its circumference. Too high cold inflation pressure, too much pressure build-up during use or (or combined with) extremely high track temperature can cause the tread to overheat. The heat is generated at the interface between the belt plies and the tread and the rubber melts, causing a local blister. The soft compound is more prone to blisters because of the low wear. Low wear means a lot of heat generation inside the compound and therefore blisters. Some tire companies have developed anti-reversion compounds that resist blistering. That's all I know about it because of course they won't talk about it. And I can see why this would work. If you can run your tire a little bit hotter without blistering that would be more forgiving for the racers using the tire and maybe the tire would give a little more grip at the higher temperature. That's assuming the anti-reversion compound has no negative trade-offs. Final stage of blistering that denied Kimi Raikkonen a shot at victory in the Italian Grand Prix in Monza 2018. If you follow another Formula 1 car, you lose some downforce, and you slide a bit more. So if you compare tires that generate more grip and slide less to one with less grip and more sliding (abrasion) and thus temperature, this will all create blisters. Effect is similar as Abrasion described before. The cause, typically, is very abrasive surface of the racing track. This can cause the stripping - shredding effect across the top of the tires when strips of rubber come off the tire rather than the usual marbles. Sometimes track surface seems to be lacking of bitumen in the track surface, exposing filler materijal (stones and gravel almost on its own and nothing in between), causing big increase in macro roughness of the surface making it very abrasive. It's almost like driving on a sandpaper surface. From 2010, only tire change is allowed during pitstop. Refueling is banned, and drivers have to start with all fuel needed for race. This will put additional load to tires because until now, car was loaded with 50 to 60 kilograms of fuel, and now this load is about 150 to 170 kilograms. And there is another thing to consider. With refueling, pitstop duration was about 6 to 9 seconds, and a plenty room for good strategy and overtaking trough pits. Without refueling pitstop duration is around 2 to 3 second and strategy should be impeccable. Often this short time can't be used for any meaningful strategy. But anyway, during pitstop in one typical Formula 1 race there were places to be won and lost to other drivers by mistiming the stop, so how did the teams decide? The teams have a more sophisticated timing system than the one available to the public and media. It divides the lap into ten sectors, rather than the basic three available for rest of us and this gives them a much faster evaluation of the way the tires are behaving. Rather than wait 20 plus seconds to find out whether they are going off, they can tell every (more or less) 8 seconds how the performance is going. Engineers and computers study the trends and make the strategy calls based on what they see. This works in two ways; it tells them the precise moment when their tire compound are losing performance, and by reading the sectors of cars already on different compound, they can see what performance gain rivals are experiencing. After one driver has pitted and his lap times went from 1m 19.7s (old tires) to 1m 17.6s (new tires - different compound). Rival engineers could see immediately the speed advantage he was getting from his new tires and decide to do and when to do their pitstop. What is the most important part of a racing car?